The apparent battle between Apple and the FBI at least tells us that the post-Snowden privacy debate is still alive. The subject of the controversy is an iPhone belonging to one of the San Bernardino shooters, and the FBI did not choose this case randomly. If the surveillance state is to have any hope of gaining their vaunted “backdoor” into the electronic devices of everyone, then preying on the fear of terrorism has the biggest chance of success. “Fourteen people were slaughtered and many more had their lives and bodies ruined,” Comey wrote on the Lawfare blog. “We owe them a thorough and professional investigation under law. Comey said the phone’s data might have information leading them to other terrorists, even though indications are that the two shooters were self-radicalized. However, what if this debate is actually a sideshow? What if the government already has the ability to hack into the iPhone? As the surveillance state was met with fierce resistance for trying to force companies to install “backdoors” to their encryption, it was looking for other ways to gain the access it desires. A secret “decision memo” was recently leaked to the press which details a meeting of the National Security Council that took place last November. The meeting of senior officials provided a framework for attempts to work around the “backdoor” issue, and shows that agencies already possess a deep understanding of tech companies’ encryption. “What the court is ordering Apple to do, security experts say, does not require the company to crack its own encryption, which the company says it cannot do in any case. Instead, the order requires Apple to create a piece of software that takes advantage of a capability that Apple alone possesses to modify the permanently installed “firmware” on iPhones and iPads, changing it so that investigators can try unlimited guesses at the terror suspect’s PIN code with high-powered computers. Once investigators get the PIN, they get the data. Knake said that the Justice Department’s narrowly crafted request shows both that FBI technical experts possess a deep understanding of the way Apple’s security systems work and that they have identified potential vulnerabilities that can provide access to data the company has previously said it can’t get. Many security experts believe that the FBI and NSA can already hack into an iPhone without Apple’s help, using a number of techniques such as “infrared laser glitching” or “de-capping.” Edward Snowden backed this up last week in a virtual interview with Johns Hopkins University. These techniques, although risky to the chip, are already in use by the most advanced hackers and, very likely, the NSA. 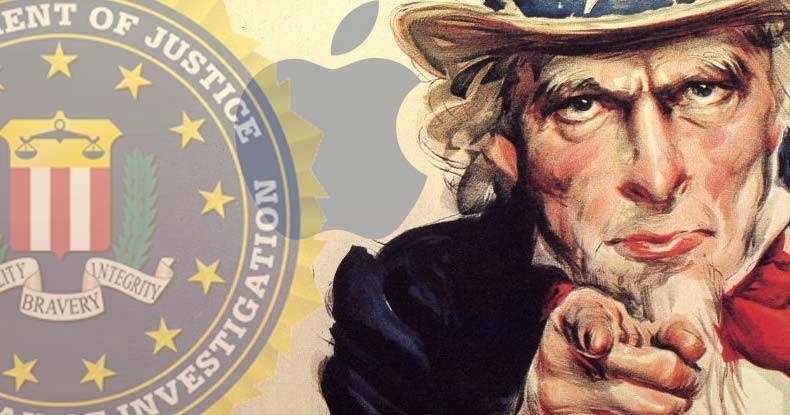 If the government already has its own access to the iPhone, then the FBI’s chosen “debate” with Apple is an exercise in wearing down public resistance to the surveillance state. The Department of Justice (DoJ) could have used a dozen other cases of locked phones to push this debate. On Tuesday, it was reported that DoJ was pursuing about 12 court orders to force Apple to help extract data from iPhones. But the San Bernardino terror case gave them an opportunity to sway public opinion. Indeed, as The Intercept reports, authoritarians are salivating at the possibility of trampling over the last defense of tech companies and privacy advocates. “In Suffolk County, Massachusetts, district attorney’s office spokesperson Jake Wark said prosecutors “can’t rule out” bringing their own case of a locked cellphone before a judge, too. “It may be a question of finding the right case,” he told the Wall Street Journal. Then there is the unusual piece of news that the Apple password on the shooter’s iPhone was changed less than 24 hours after the shooting, which meant that automatic iCloud backups were put on hold. The password was changed by someone at the San Bernardino Health Department at the FBI’s behest. Apple says that if this had not happened, all the information sought by the FBI might be present on iCloud backups. It now only has backups up to the week of October 19. The FBI claims that it did this to gain “immediate access to the iCloud backup data.” But why would it sacrifice total access to gain immediate access? After having created the difficulty of gaining the access it wants, government is now attempting to force the tech company to create the backdoor to encryption wanted so badly by the surveillance state. Federal government is unrelenting in its drive to sacrifice freedom for “security,” and they never let a tragedy go to waste.